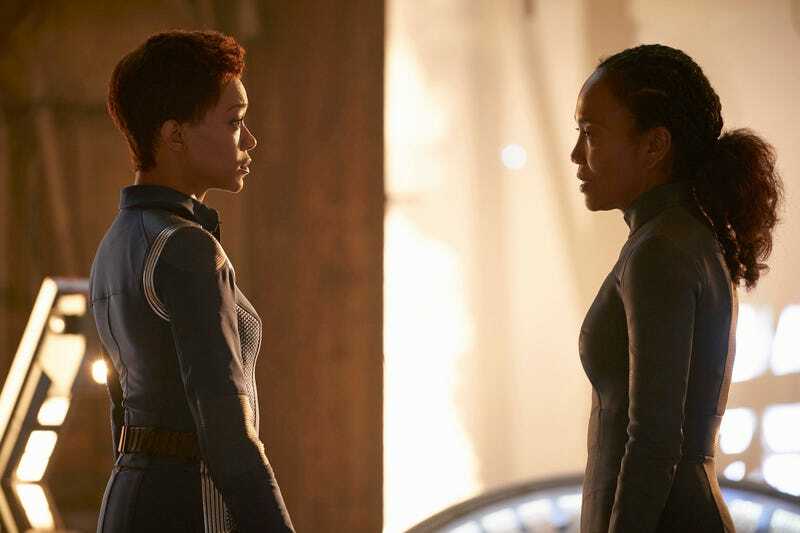 Star Trek: Discovery typically works best when it manages to marry its whiz-bang ideas to something approaching emotional truth. This isn’t new for the franchise (or for the genre as a whole), but the dichotomy here has always seemed particularly stark. 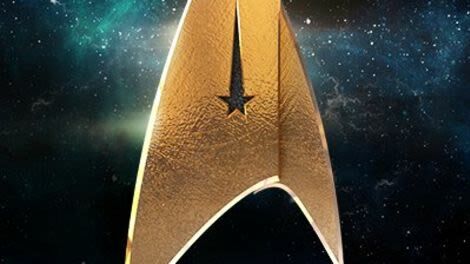 Where classic Treks would devote significant time to world-building and escalation, Discovery typically starts every situation off at 11 and goes from there. It’s an approach that runs the risk of numbing an audience to thrills, the same way yelling at a person in a small room for hours on end will likely end in hearing loss. But when it clicks, it’s pretty terrific. “Perpetual Infinity” clicks, largely because the big concepts it’s trafficking in are contextualized by a very personal tragedy. It opens with a flashback, of course. We learned last week that the Red Angel was Michael’s presumed dead time-traveling mother. This week, we learn how Mom (played by The Wire’s Sonja Sohn, who is just terrific here) got into this predicament. When the Klingons attacked their home, Dr. Burnham (apologies if she got a first name; I didn’t catch it and haven’t been able to find it online) jumped into the Red Angel suit to try and fix things. Unfortunately the suit sent her 950 years into the future, where she discovered that all sentient life had been destroyed by the artificial intelligence we call Control. She tried to return to the present multiple times, but each time was thwarted by the gravitational pull of her new temporal home. There was enough time and opportunity for her to dig into the mystery of Control and start planning ways to stop it, but never enough time for her to actually come home and be with her daughter again. Okay, so we’re going to pause for a second here as I get a bit nitpicky by way of praise. This is really strong story idea, and one that I desperately wish the show had devoted more than just ten minutes or so to establishing. It would’ve been off format, and maybe too indebted to Deep Space Nine’s “The Visitor,” but devoting more time to establishing how Dr. Burnham came to realize the situation she was trapped in, and how she figured out the truth behind the destruction of everything, could’ve been amazing. This episode still works without that, for reasons we’ll get into, but it’s indicative of my larger problem with the show: it burns through great ideas and bad ones with equal fervor and speed. It also takes so many damn storytelling shortcuts that I suspect the reason it moves so fast is to try and stop us from thinking about any of this for too long. But like I said, when it works, it works. The tragedy here is that Michael learns her mother is alive and gets her mom back—only to lose her again. It’s the sort of tragedy that’s especially effective on television, where we’ve been trained over many years to suspect any changes in the status quo as temporary; here, our innate suspicion that Dr. Burnham won’t be around forever wars with Michael’s very real, very intense need to bring her mother back home. Tragedy is at its best when the audience knows things won’t end well but hopes against hope that they might anyway. There have been enough stunning reversals on Discovery that the plan to save Dr. Burnham doesn’t seem completely impossible. And yet in our heart of hearts, we know that things are never that easy. It’s a tension that helps push the episode forward. Michael’s confusion and angst, and Dr. Burnham’s reluctance to see her daughter, provide that tension with emotional ballast. Their relationship is the cornerstone of the hour, and both actresses do everything they can to build a lifelong connection out of a small amount of screen-time. Of the two, I think Dr. Burnham is actually more successful, if only because her response doesn’t play right down the line of the most obvious choices. She doesn’t want to have to deal with Michael because she’s spent a very long time getting used to not being able to be with her child, and she also knows (from considerable experience) that any reunion is going to be temporary. Refusing to open yourself up to a loved one out of fear of greater pain (and hurting them in the process) is a strong idea that tells us a lot about Michael’s mother—how much she’s suffered, how strong she is, and how she chooses to manage that trauma. Michael’s reaction is perfectly reasonable (and is, as ever, well-acted), but it’s also not particularly interesting. It doesn’t tell us anything more specific about her as a character. “Being desperate to see Mom, angry when Mom doesn’t want to see us, and then determined to save her” isn’t illogical or badly scripted, but it is pretty generic. Most of the season’s build-up was about Michael’s relationship with Spock, and that’s turned out to be surprisingly good; whatever my feelings on bringing in yet another Spock to the Trek-verse, I’m enjoying how their relationship continues to develop and find different nuances to play with. Michael and her mother, by comparison, is just a blunt object designed to make us cry. That doesn’t make it bad, but we’re two seasons into the show now, and so far the most interesting thing Michael has done remains back in the pilot. Again, nitpicking—I think I’m just a little disappointed that I wasn’t as taken in by the emotional stuff as I wanted to be. And hell, the fact that Michael refuses to take no for an answer is definitely a character beat. Dr. Burnham’s speech about having seen Michael at all these formative moments in her life, about always having been there even if Michael didn’t know it, is powerful stuff, albeit slightly undercut by the fact that we have no idea how the Red Angel would be able to stealth in public. And the end, which has Michael swearing she’ll find her mother as Dr. Burnham is sucked back into the time stream with a broken suit, is exactly the right kind of downer—most but not all hope is lost, and the day is saved but only at great cost. It’s good, but it wasn’t as good as it should’ve been, and that comes from a lack of context, and okay I realize you’re all as sick of hearing me make this argument as I am of typing it. The other big event this week is Control taking over Leland’s body to take more direct hand in things. It’s silly, albeit in a fun way; Control even takes the time to give Leland a monologue before injecting him with evil nanomachines, so presumably part of the info it got from the Sphere was a crash course in How To Super Villain. Control-Leland then tricks Tyler and Georgiou into almost getting him the rest of the Sphere info, which is turning into the season’s most critical Macguffin. Georgiou realizes the truth almost too late (after a conversation with Dr. Burnham that’s absolutely terrific), and we get a knock-down drag-out fight that ends with Mom getting sucked into the void, and Control-Leland back in the Section 31 ship with %54 of the Sphere data. A lot of this is silly science fiction, but that doesn’t mean it can’t be fun. There’s little room for complexity or ambiguity here, and every time the series tries to inject some (like in the way people keep having conflicted feelings about Tyler), it’s rarely effective. When it comes together in spectacle and believable passion, though, it’s nifty. And I’m always a sucker for time travel. Dr. Burnham has no idea about the signals that started all of this. Given that she seems to know everything else, that’s odd to say the least. I don’t know why Dr. Burnham keeps getting pulled to a specific point in the future. I don’t consider this a plot-hole because it’s very possible I missed something, or that it’s information that will come out at a later point. Dr. Culber is back at work again. I still think my Borg theory is going to pan out. “Hamlet. Hell yeah.” Okay, I’m docking half a letter grade for this exchange because it made me cringe.